Thank you, fellow students at Teachers College! It is an honor to be your elected International Student Senator for 2016/2017. Honestly, I didn't expect to be elected as all 10 candidates are true contenders with something unique to bring to the table. 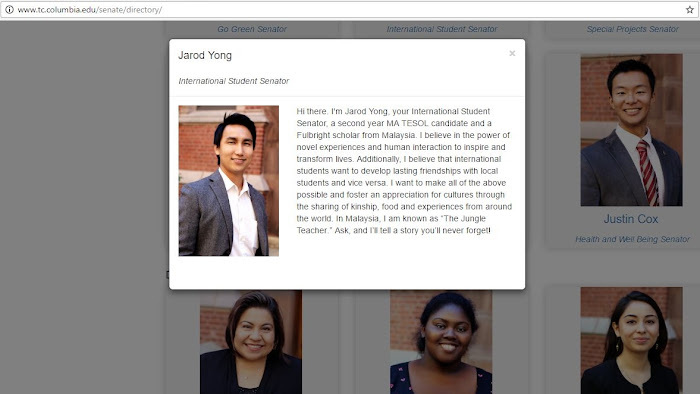 I will do my best to serve both the internationals & US students at TC. Our interests are not mutually exclusive, inclusiveness benefits all. make our time here as enriching as possible. "the actions of the Student Senate are meant to promote the social and general welfare of students by serving as the representative, advocate of, and liaison to the student body to the Teachers College and Columbia University communities, including its administration, faculty, staff and alumni. We work to gather and express student opinion while fostering communication regarding College-wide issues to the student body; to develop a cohesive community by nurturing a sense of friendship and respect within Teachers College and within our larger University community and neighborhood; and, to welcome the collaboration and participation of students, administration, faculty, staff and alumni. We dedicate the Student Senate activities to the college's mission of diversity and to embrace and promote the rich diversity, community, and civility of the student body; to encourage student organizations to develop and implement activities that serve Teachers College students and the larger University community; and, to discuss matters concerning the broader University community and present and support conclusions to the University Senate and the University administration."